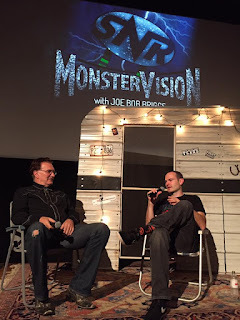 The Horror Movie BBQ: MonsterVision In Rochester! Last night, I had the absolutely joy to travel back to TNT circa 1996! 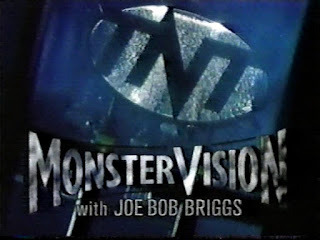 If I'm not referring to the nWo, I must be referring to TNT's MonsterVision starring the B-Movie lovin', ex-wife hatin', Drive In Total countin' host, Mr. Joe Bob Briggs! The weekly series in which our friend Joe Bob introduced the best and sometimes worst in horror and scifi movies! 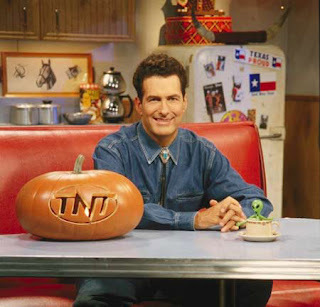 Along with his trademark wit and extensive knowledge of these films, Joe Bob also had guest stars, "Mailbag Girls", and the famous DriveIn Totals, in which he'd put out the things to look for. While Joe Bob has contributed a lot to the world of cinema, it's from this memorable tv show that we all remember and love him the most. Although, if you ever want a great laugh, check out his commentary on multiple movies including I Spit On Your Grave! Sadly for us fans who watched this show, in the year 2000, TNT made a big format change and to become a more serious and respected network. So things like Monstervision was no longer need and eventually, the show was yanked and Joe Bob was shown the door. A very sad day for us all. But, while Joe Bob's 5 year reign as the king of the B's was never forgotten. 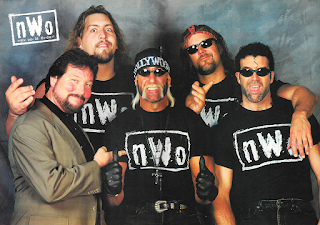 In fact to this day, Monstervision is still invoked with nostalgia, joy and laughter. Which was, of course the goal. So, fast forward to 2016. 16 years after the show was shut down, our friends at Fright Rags and The Little Theater were ready to screen the Warriors for their special feature, called "Saturday Night Rewind" where a favorite from the past is shown in delicious 35mm for all to enjoy. Past shows have included Raiders of the Lost Ark, Critters, Rock N Roll High School, just to name a few. But only one man could introduce last night's viewing and help kick off Halloween season properly. That's right. They called on the the man in the cowboy hat to bring back the Drive In Totals. 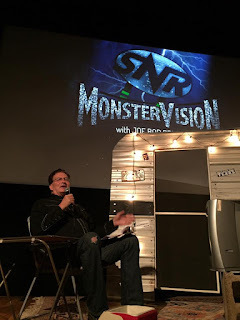 They brought back...MONSTERVISION!!! 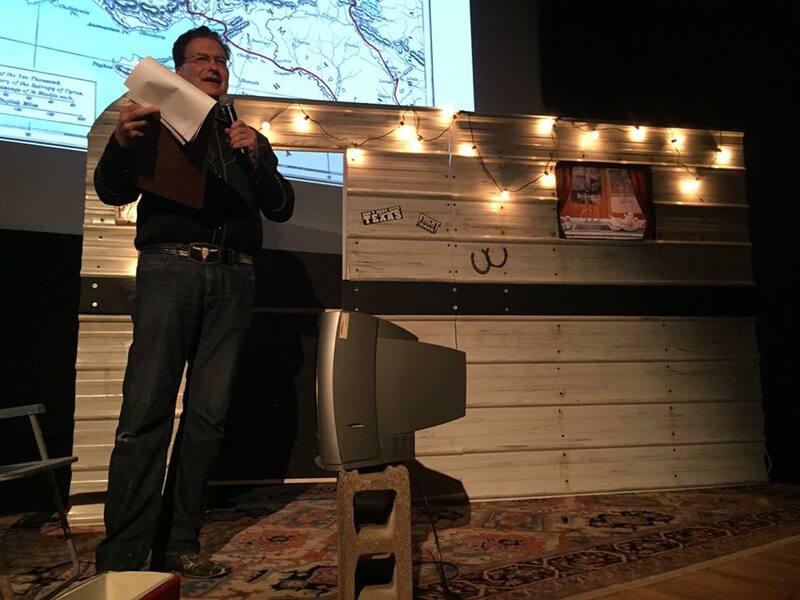 Oh and this was not just Joe Bob walking out on a stage and pointing to the screen. NO SIREE. 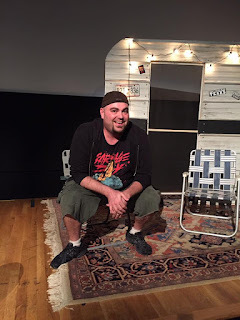 Members of the Fright Rags team actually constructed a replica of Joe Bob's trailer to walk through, to which Mr. Briggs even commented this was the first time he's had a screening have a trailer on stage, so he could introduce the movie. And let me tell you, when he walked through that door, everyone lost it. 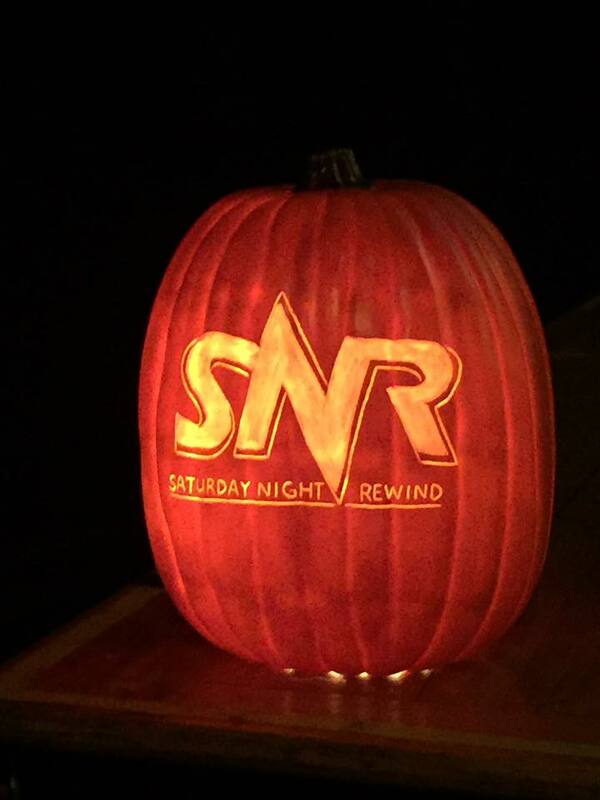 We were all 14 year olds watching the show on TNT all over again. It was great. Mr. Briggs provided a lot of information as to the origins of The Warriors, including the novel of the same name and the tale of Xenophon's Anabasis, which the novel itself was based off. Professor Briggs was indeed laying some cinema knowledge on all of us and providing that great humor of his as well. So after delivering his Drive In Totals once again, it was showtime! Now, I can tell you that this is now the second time I've seen The Warriors in 35mm this year and it's truly the best way to see it. The raw feel of the film projected through crackling, dirty film just provides it's own character. If you ever get a chance to see this movie on the big screen, don't hesitate. 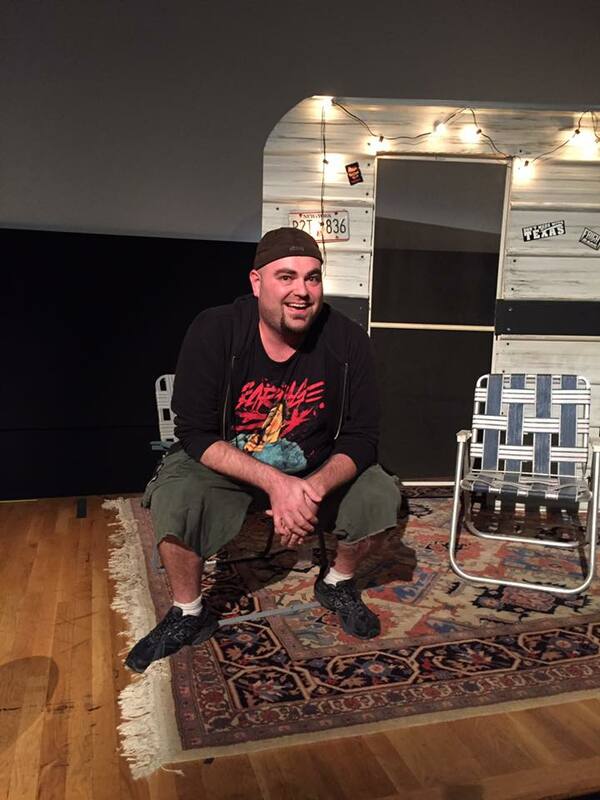 After the movie, Ben of Fright Rags conducted a very entertaining and informative Q&A with the man of night. 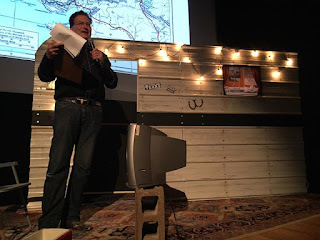 Joe Bob shared the history of his fictional name, his experiences of being boycotted by a women's group, dealing with TNT brass, and my favorite, a story about how he feared airing Barbarella due to star(and Ted Turner's wife at the time) Jane Fonda's disdain of her famous role. One bad joke, you could've said bye-bye to Joe Bob much sooner. Thankfully, it turn out that way! 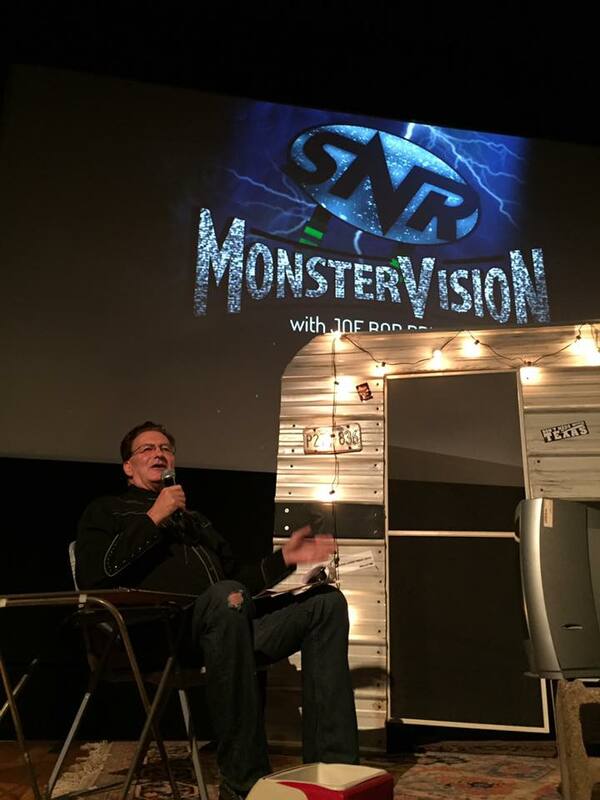 After a fun question and answer session, it was time to say goodbye to the trailer park and Monstervision once again. But what a way to get closure! 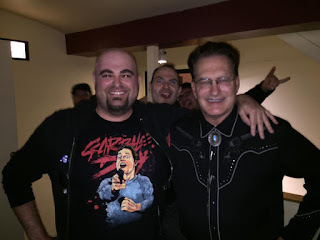 Joe Bob took the time before and after the screening to meet fans and sign whatever was brought his way. I got to chat with him and hear stories about working for Turner in the WCW/Bischoff era and the fact that WCW was never really promoted on Monstervision. Which is still weird to me, considering the cross over audience. 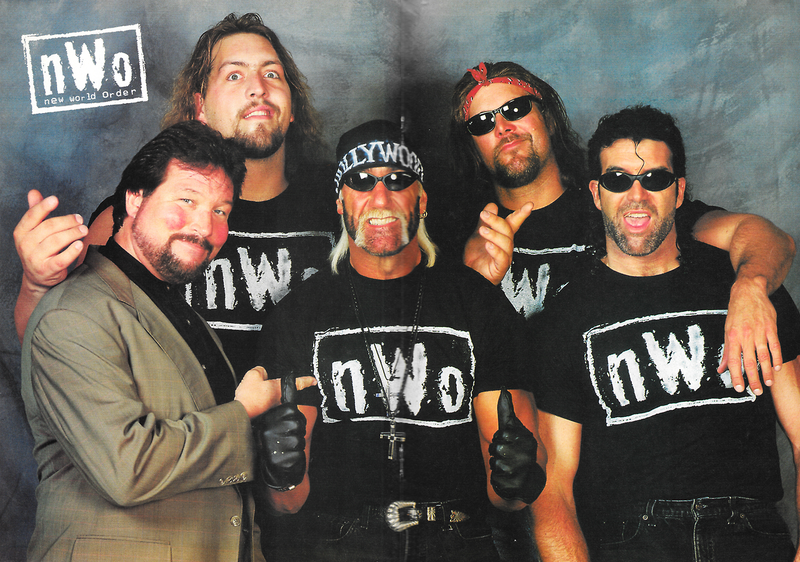 But he spoke highly of WCW and The Bisch. What a time to be getting a check signed by Ted Turner, huh? Oh yeah and I couldn't leave without some Married with Children items signed. Under his real name, John Bloom, he portrayed "Billy Ray Wetnap", Kelly's boss and skeezy bug exterminator. 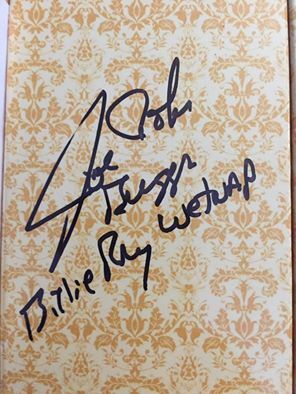 I had him sign my Married with Children box set, an item I've wanted to start getting costars and guests on it. So what better way to start? Also...thanks Ben Scrivens and his family proving a great background, I walked away with a fantastic photo op! The Little Theater and Fright Rags put their biggest and best effort out tonight. And it showed. Everyone had such a great time, new friends were made, old friends reconnected, and old Saturday night traditions were resurrected. Perhaps this Saturday Night Rewind will be the new Monstervision for some? Who knows. But after going to many showings of movies at the Little, I can tell you that it's worth the trip. In fact, my buddy Morgan actually made the 2 hour drive to come by and check out the Little! This was one of those nights that not also reinvigorated my Halloween spirit but made me love this town even more. Rochester may not be the biggest and most flashy town in the world but it certainly is one of the most comfortable and loving. The art/movie community of Rochester, NY is one of the most warm and welcoming groups I've ever interacted with. Both Fright Rags and the Little are two of my favorite aspects of Rochester, so to see them work together to deliver something so great and interactive for fans is just something so overwhelmingly enjoyable. I certainly hope this isn't the last fun event that both have in store for us. Then again, knowing them, it's not. They've only just begun! So a major thanks to both Fright Rags and The Little Theater for providing such a phenomenal night. I cant speak highly enough about all parties involved. I'll be talking about this for years! I meet Job Bob a few years back one hell of a guy! I really miss his show would love to see it come out in some format. I do own one of the two dvd's he put out but it was just ok.